The last series of Galleries, in the Castle cellars, takes visitors on a amazing journey which begins in November 1922. "Together, the excavators stood in front looking at the seal impressions....Nervously, Carter made a small hole in the door, and reached up to hold a candle. The candle flickered as the air escaped..." The excavators widened the gaps in the plaster and Lady Evelyn, Lord Carnarvon’s daughter, Lord Carnarvon and Howard Carter climbed in and everywhere "There was the glint of gold..."
The themed exhibition of the discovery of Tutankhamun's tomb includes over 60 incredible replicas, wall paintings of the tomb and photographic archive. Browse the Gallery of images taken in the Egyptian Exhibition. You can see all of these beautiful replicas of objects from Tutankhamun's Tomb in the Exhibition in the Castle cellars. 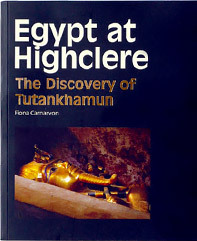 The story of the Egyptian Exhibition at Highclere Castle. Written by the 8th Countess of Carnarvon, the book features many full colour photographs of the artifacts, replicas and wall murals and tells an incredible story of perseverance over 17 long years of discovery. All of Lady Carnarvon’s books are available to purchase online at the Highclere gift shop.